Is dancing a cause of short stature? My daughter is 10 years old. Would practicing Kathak during pubertal phase affect her adult height adversely? Kathak is a classical dance of India. It is a traditional belief that children who undergo dance training during their pre-teen and teenage years usually do not grow tall. Doctor please clarify this myth. Short stature refers to height that is below third percentile for the age. Several intrinsic and extrinsic factors influence children‘s growth and their eventual adult height. Therefore, in otherwise healthy child, slowing down of growth during any phase of childhood development can not be attributed to a single factor, and least of it to a physical activity like dancing. Dancing is a form of stretching exercise with desired muscular activity during growing age. It strengthens bones, and minimizes the chances of childhood obesity. So where does this myth come from? Training in classical dances requires rythmic movements of the body along with specified expressions, which are in concord with the music played. This causes considerable stress in a young learner, that takes away the fun associated with dancing, an artistic expression of innermost emotions. Dance when performed spontaneously for pleasure, besides being an excelllent workout, is a way to release clogged up negative emotions, the quality that is used as dance therapy. But, this is not what we are talking about. Dance classess take young people away from outdoor activities, where peer interaction is overpowered by the the dance instructor, and the pleasure of creativity is plagued by the expectations of the adults. As a result, release of mood elevating and growth promoting hormones is supressed by stress hormones. The play of hormones is most prominent during puberty. Though the pubertal changes in some girls set in as early as 8 years of age, the average age of onset of puberty is 11years in girls and 12.5 years in boys. Therefore, the height gain of children between 6-11 years of age is not adversely affected by intense training in competitive sports, dance being one of them. The great growth spurt of adolescence is associated with sudden surge of hormones of puberty. 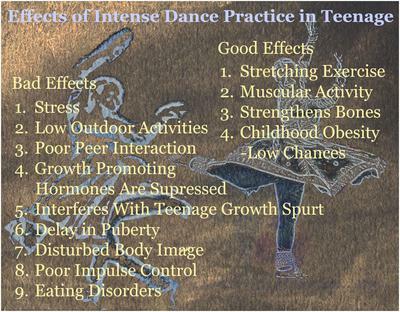 Intense dance practices can delay puberty, and thereby interfere with the speedy height gain of teenage (see the graph of the growth pattern). Teenage growth spurt begins around 11 years of age in girls and 12.5 years of age in boys. It lasts for about 5 years. One fifth of total adult height is gained in these 5 years at the rate of 8-9cm./yr in girls and 9-10cm./yr in boys. However, not all who are involved in intense sports during teenage end up with short stature or abnormal sexual development. Most of them fall in the category of constitutional short stature, who do bloom but later than their peers. Therefore they are commonly termed as “late bloomers”. 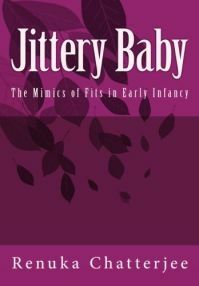 Despite the fact that late bloomers grow up to their full genetic potential, during formative years they often suffer peer ridicule, emotional distress, and disturbed body image, which may continue to haunt them throughout the adulthood. (Interested? – Read chapter 34. Peer Pressure Effectuates Disturbed Body Image and more). Nonetheless, 1 in 6 dancers, who start dance training during pubertal phase, do develop short stature. These girls are usually highly sensitive and competitive. They want to be the best. Undue competition leads to disturbed peer relationships. The stress that follows takes its toll on their health, both physical and mental. Moreover, teenage is the phase when youths are concerned about their looks. They compare themselves with their peers. Their self-concept takes a beating. Dancing also implies bringing out the beauty of the body, and teenagers’ body is not yet fully developed, least of all of those who are experiencing slowing of growth. The media too constantly bombards the importance of thinness for dancers. Thus, many childhood dancers strive for an imaginary ideal figure. They begin weight control practices too early in life. As a result, their nutritional intake suffers a serious setback. In addition, the young dancers, while endeavouring for perfection in their figure and dancing, tend to become more and more touchy, impulsive and perfectonists. Their ability to control their emotions is noted to be particularly poorer than that of nondancers of the same age. Girls with such a temperamental kink, even under moderate dance practice, may slowly sink into eating disorders, the consequences of which are poorly understood and controlled. As compared to this, short stature even if considered a blemish, is a very minor one.